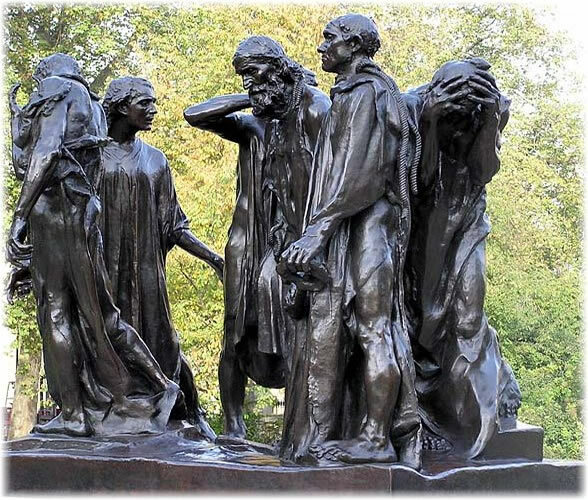 I have been remembering these conversations quite vividly over the last few weeks since my close Korean friend Ko San recently shared with me a photograph of Auguste Rodin’s sculpture masterpiece “Les Bourgeois de Calais” (The Burgers of Calais). The scene depicted is from 1347, when King Edward III of England’s army forced the French city of Calais to surrender after a long siege during the Hundred Years War. Edward offered to spare the people of the city if any six of its top leaders would surrender themselves to him. When the city of Calais surrendered to the English, the six individuals came out to suffer punishment on behalf of the vanquished city were all representatives of the educated and privileged class, the burgers who felt that as responsible citizens they should sacrifice themselves for the group. Rodin’s sculpture captures them not as proud heroes, but as ordinary individuals deeply distressed and fearful of the fate that awaits them. Rodin strove to capture the full significance of the sacrifice they offered through such realism. Historical records say that the citizens of Calais who offered themselves up were ultimately spared. The tale embodies for us the tradition of noblesse oblige, the duty to society of those who are born well. When I first came across the term noblesse obligeas a boy, I learned it with a rather negative, or diminutive, connotation. I understood “noblesse oblige” to refer to such little efforts of the wealthy to put a silver lining on their relations with society. To offer to pay for the schooling of the children of their servants, or to offer a goose to the farmers on Christmas Eve. I have since learned that the term can be used in this most profound sense as the sense of responsibility of those of the ruling class to sacrifice themselves first before all others. Although I would not be so naïve as to assume that in years past that all the well-born did so, there is something in that tradition that has been lost. It is hard to imagine a situation in which the super-rich would suggest they need to sacrifice themselves before the poor or poorly educated. Let us return to the statement, “I can’t believe how stupid American voters are!” The assumption is that the poor political system we observe,the manner by which poorly educated Americans are misled by politicians, is a result of their pathetic ignorance, or a result of the cynicism and opportunistic mind of politicians. But the argument is entirely backwards. If average citizens are having trouble understanding how politicians mislead them, it is because those who have the judgment and the education to understand what is really going on do not feel any obligation to help them, or cannot find any way to communicate with them. Whether it is by talking with ordinary citizens about contemporary issues, or by supporting programs aimed at educating ordinary people, the privileged in society could do much to help ordinary people respond to such challenges. If common people are misled, it is ultimately our fault. I am always astonished at how forgiving working people are of people like myself. Here I have enjoyed so much in my life that they have not. And yet when I talk to the remarkable people who clean our streets and bathrooms, who cook up food and serve us, who sell us goods at markets and at stores, they are unfailingly courteous and show little trace of resentment. I have an enormous obligation to them. One of the things that always disturbs me about American politics is the contempt that the upper classes have for those not as privileged. This cross all ideological boundaries. Feminist scholars and those on the left, especially in academe, are almost more guilty of this than others, but there’s plenty of blame to go around. For example, the recent kerfuffle over the anti-illegal-immgrant Arizona bill is a teachable moment. The voters of Arizona, racist or not, decided that *illegal* immigrants should not get public services. And yet, urban, largely East Coast intelligentsia framed this as “Hick racism” and redneck cultural chauvinism. The fears – however unjustified or justified – of the people of Arizona were irrelevant. Again, the right is as guilty of this as the left, though the left, especially the left-academic communities, are much more censorious and tend to use more shaming language to silence debates they don’t feel competent to have in a public context. The masses aren’t (yet) educated enough to understand what’s good for them or not. Not like we do. We know what’s best for them, and for China. We know their interests better than they do. Anyway, we’re more important. My university degree and my limited life experience and my background mean, … my opinoin is more valuable. Until the public has the same opinions that I do, and the same background, they shouldn’t be allowed to vote. I know their interests better than they do. This is how it’s translated. It’s identitical in sentiment to the American intelligentsia complaining about this or that election result. It’s this intelligentsia in China that has been bought, purchased and paid for by the Big Brother government. I’ve never seen such avid fans of autocratic, one-party rule by corrupt party bureaucracy than I’ve seen among China’s non-governmental intellectual elite. The attitude of not-so-genteel paternalism that infects the Chinese establishment is profound. Often, you need to engage people on a one-to-one basis, but as soon as you hear the “China’s not ready for democracy” qualification, you know exactly how the speaker self-identifies. It’s amazing: There are no end of academics who are stunned when, say, a Republican candidate wins. “But I don’t know a single republican voter. Where are they?” It might perchance make a difference if you, um, say, get out and about for a bit. In Korea, the same effect is at play. A year ago, not one person thought the ruling party was worth a second’s consideration. I know no-one who didn’t loathe and detest I MyunBak and his party, and yet, … they were just re-elected. Where did the voters come from? Who voted, then? That’s the troublesome thing about democracy. If there’ s a fair election, quite often, the results are not what those who envision sugar plums expect. Indeed, many on the left have called for limiting democracy, out of fears that voters will vote in their own interests and not along party lines. The same is true on the right. Ultimatley, voters should get what they ask for. To be presumptuous and deign to make decisions for them is paternalism. I loved Cato, personally. Plutarch put says he said it, and whether or not it’s true, Plutarch’s Cato said it best. As Thomas Frank pointed out in his book “What’s the Matter with Kansas?” many Midwestern and Southern voters in the United States care more about social than economic ideas and will often vote against their own financial interest. From a certain perspective, they are more true to their ideals than the educated classes. I know your business better than you know your business. It’s reducing other people to who disagree with you to the status of mental patients who need to be force-fed their meds. I’m pretty sure taxi drivers know their needs. It’s funny how those in places like Kansas and elsewhere are rarely in doubt about how they know what they want. The fallback position is then that if it’s not error or false consciousness, then the erroneous voter must be evil. Racist, reactionary, sexist, religiously chauvinistic, etc. Or bought off. Or angling for something. Elites never just admit the very likely possibility: the voters and the poor know their own interests, and can make their own decisions. I’m sure that if china, say, had a fully democratic government, creating new neihjbourhoods from scratch would be harder. You’d have to honestly and fairly deal with residents who resist change. But I argue that that’s a feature, not a bug. One of tha hallmarks of intellectual elitist pandering to autocracy and elitist notions of public good is a tendency of elites, especially academic elites, to gravitate towards autocratic forms of government. They more naturally feel at home in a quasi-aristocratic setting. They know best. They are the experts. Everyone else should follow. My great plan is good. Virtually the entire left centre establishment in thewest is a member of this group: the Frank admiration for the collective will that a society like china represents illustrates the lefts elitism. It’s appalling. On the right is the same disdain for the people, but it’s also mixed with naked self interest. I’d note that the concern on the left is largely misplaced. Its rare to the point of being nearly invisible to find thinkers and intellectuals who actually support democracy and the will of the people. I’d note that the left and right were very cozy with authoritarians of all stripes before wwII. The lone voices of reason -shirer reporting from Germany, for example- were drowned out. If you didn’t support Stalin in his savage murderous purges, then you hated the poor. The same person could turn around and say if you wanted war with hitlers Germany, then you were a warhawk, a violent bloodthirsty monster. Inevitably, the intellectual caste us usually little more than a shill for whatever power-hungry autocrat or ideology is currently in vogue. Cicero was a great example. Sensing that it had all spiralled out of control, he showed some courage and went after Marc Antony. But this was after propping up another man to battle j Caesar. One way to lose your hands. And then The intelligentsia, who were so sure they knew best, and ignored the people, end up shocked that x or y revolution didn’t go the way they expected. Listen to the common people. Lead them, but don’t tell yourself you know their wishes better than they do. Please note that the Siege of Calais was begun in 1346 and ended in 1347, with the surrender depicted in the sculpture, and not 1387. Also, something could also be said about your interpretation of the story – though its sentiment is quite admirable. The burghers, walking behind their surrendering captain, incited the emotion of defiance in the French population by their pitiful sight, which is what made Calais so important, and the topic of nationalistic poems etc. in the Hundred Years’ War. They came out surrendering, barefoot and in their shirts, with halters around their necks. This was not some vague symbolism of their being willing to suffer for their city as much as their confronting the reality of then current law – those surviving a siege if defeated were eligible to be put to death. The halters around their neck signified their acceptance of their conqueror’s right to hang them. These were men who acted bravely in battle, resisting a siege for as long as they could, defending their city from an invading conqueror. Though there are no limits to viewing them in a heroic light, it was their pitiful appearance that made the surrender of Calais so memorable. To me it speaks of the miseries of war much more than the obligation of nobility. Thank you AZG for the comments. Date has been corrected, and the work of Rodin identified as a sculpture, not a “painting”. As for the meaning of war, it is always multivalent. I recommend Chris Hedges “War is a Force that Gives Life Meaning” as a thoughtful consideration of this old question, but you can read Hamlet as well. I think Rodin certainly agreed wit the misery interpretation. When Rodin made the sculpture, perhaps he was thinking of the Paris Commune, or many other recent miserable events. But whatever the historical event of the 14th century, or what it meant in France of the late 19th century, the fact is that the meaning as a symbol of an elite who are willing to sacrifice themselves has entered the popular folklore. And as such seems a noble goal. I can agree with that. Both things were happening there for sure and not just the first, for in fact, Edward didn’t put them to death, and they saved everyone’s life by putting themselves first. (And his wife had a role in convincing him not to hang them, a behind the scenes hero). And another heroism within the misery lies in the very fact that Calais was in fact won back by the French, and the British expelled from France, though across five generations of fighting. But that is the perfect kind of heroism to invoke hope in a time of hopelessness. So good work… in the end I think noblesse oblige is actually very fitting here. And thanks for the Hedges tip looks very interesting.